It's 8:24 local time here in Paris and I've just woken up. I'm pretty much sore everywhere after our afternoon walking around but just wanted to jot a few things here, mainly as a reminder to myself because I have a memory like a sieve. Due to our travel paranoia, we ordered a taxi to take us to Sittingbourne station at 4:30am. For once the taxi showed up early and the journey is only 5 minutes so we had about 40 minutes to kill at a station where nothing was open. I took a few pictures and apart from seeing a woman throw a hissy fit because the ticket machine wasn't working, nothing much happened. Once we reached St Pancras, we went to get breakfast. We ate and made sure we had our tickets and passports in our hand luggage then went through passport control and all that. Our train left St Pancras on time and after what felt like two minutes, we were already blasting through Kent then it went dark outside. I put a film on and I must have only been watching it for 20 minutes or before I noticed we were out of the tunnel and looking across French countryside. I spent most of the remainder of the journey watching the world go by. At one point somewhere north of Paris (I think) it was snowing a blizzard and it looked as though we were in for a Wintery trip. At one point while we were in the middle of the snow covered country, our train stopped. The reason being the train ahead of us had broken down. We were told we'd be sitting there for at least an hour but then we were re-routed on slower lines. It meant it took longer than expected to reach Paris but it gave us the opportunity to see parts of France we wouldn't normally have done. After we arrived in Paris, we headed for the Metro as it's a fair walk from Gare du Nord to Montparnasse, especially with luggage. After a few wrong turns walking around Montparnasse we made it to our hotel. We unpacked, chilled out for a bit then headed out to explore. Since it was only a few streets away, we went to Montparnasse Tower for a full panoramic view from its rooftop. 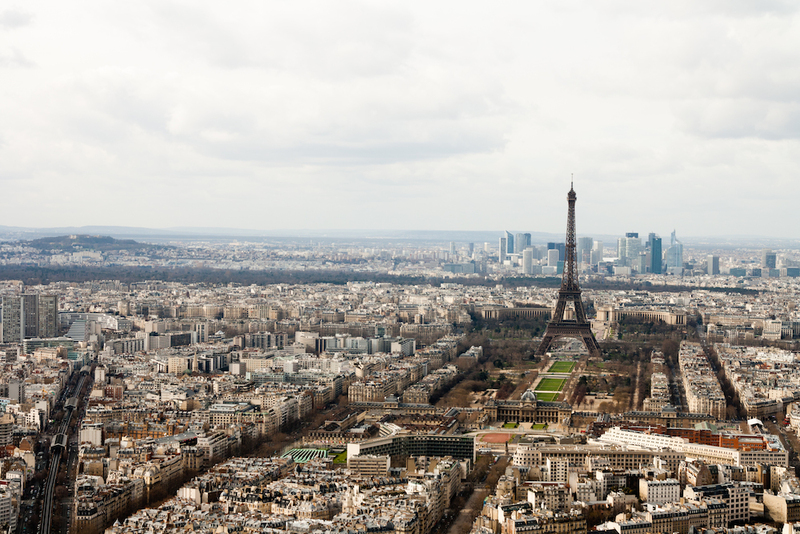 From here you can see pretty much every Paris landmark including the Tour Eiffel itself as well as Les Invalides, Arc de Triomphe, Champs-Elysées, Sacré-Coeur, the Louvre and Notre-Dame. So it's pretty much a must in my book if you come here. From here we decided to walk to the Tour Eiffel and while we were checking a map a few times we just headed in the general direction and took in the sights along the way. One which we didn't intend was to see Les Invalides up close. Eventually we made it to the Tour Eiffel. After walking for so long we wanted something to eat and came across a crépe stand right by the tower. I had a really nice waffle and Lu had a crépe, part of which she gave to a bird who ate it right out of her hand. As we ate we walked up to the tower and the sheer size of it, I was not expecting. I knew it was huge but had somehow thought it'd be smaller. We queued for ages but then eventually made it to the elevators and headed straight to the top. This is another view you must see if you visit France. Even if, like me, you're not good with heights. Once you're there, it's breathtaking. Like the Montparnasse Tower, you get a full panoramic view of Paris, but the change in location means you can see some things which you can't in Montparnasse, the river Seine for example. I would have stayed up there for hours if it weren't so windy and cold, plus we were starting to tire from all the walking. We walked back to our hotel before going out for dinner. We found a great place just up the street called Mise au Varre. After dinner we pretty much collapsed from tiredness. So that's pretty much how day one went. I'm about to get up and get ready for day two, if my legs will allow it!